A truly innovative and multifaceted product,Dermastir Filler Sun Powder SPF50+ takes sun protection to a whole new level. The fine powder acts as a filler using nanotechnology to penetrate the wrinkles, protecting them from further damage caused by UV rays and it also reduces their visibility.Active vitamin C has been added in order to prevent pigmentation. The powder form effectively helps oil control and reduces poor appearance as well as having a mattifying effect on the skin. 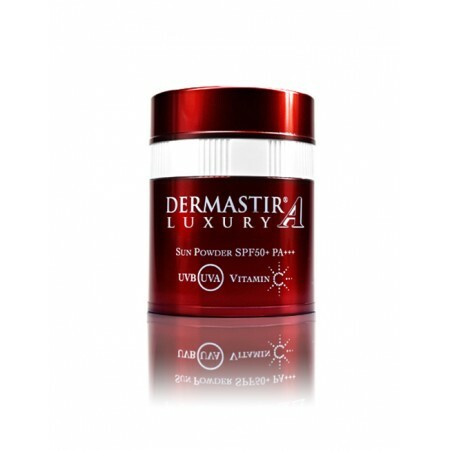 Dermastir Sun Powder is waterproof and is available in translucent form. Remove cap and turn dial clock-wise to dispense the sun powder. Use puff to apply all over the face. Apply more sparingly on the wrinkles.